In February of 2006, a representative of the Archdiocese of New York called Saint John’s Abbey to report that a former Saint John’s Abbey monk/priest, Father Agustin Cerezo Murillo, had been credibly accused of multiple allegations of sexual abuse while serving at Saint Anselm’s Church in the Bronx (New York) in the late 1960’s. For over ten years, Abbot John Klassen has deceived the Saint John’s community and failed to advocate for – and validate the abuse suffered by – Father Cerezo Murillo’s victims. Father Cerezo Murillo entered the Novitiate at Saint John’s Abbey in 1949 and professed his solemn vows in 1950. 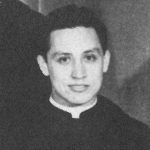 Father Cerezo Murillo received the order of Diaconate in 1955, was ordained on June 8, 1956 and said his first mass at the Basilica of Our Lady of Guadalupe in Mexico City two days later. One of Father Cerezo Murillo’s victims was 11 years old at the time she was abused in approximately 1969. By the next year, Father Cerezo Murillo was removed from Saint Anselm’s and quietly moved to Mexico where he was reportedly incardinated into the Roman Catholic Archdiocese of Mexico in the early 1970s. The abbot at Saint John’s Abbey at the time Father Cerezo Murillo was caught, recalled and released was Abbot Baldwin Dworschak, OSB. Despite multiple credible allegations, Saint John’s Abbey has yet to release any information or documentation regarding Father Agustin Cerezo Murillo. If fact, they’ve done the opposite. The files released in the Transparency Initiative are those of all the monks, past and present, who have likely offended against minors. Saint John’s Abbey voluntarily released comprehensive personal files of 18 monks who likely offended against minors. The release of the files is part of a decades-long commitment by the abbey to prevent sexual abuse of children, to help the healing of survivors and to hold offending monks accountable. “The files reflect all the effective actions that have been taken in the past quarter-century to publicly reach out to other survivors of abuse and to implement effective policies and actions to stop additional incidents of abuse.” said Abbot John Klassen, OSB. There has not been a decades long commitment by the abbey to help the healing of survivors. There has been no public outreach to the victims of Father Augustin Cerezo Murillo. The Father Agustin Cerezo Murillo matter is a perfect example of how Abbot John Klassen has deceived the Saint John’s community and failed to advocate for – and validate the abuse suffered by – Father Cerezo Murillo’s victims. Yet another example of how Abbot John Klassen has failed as Saint John’s spiritual leader.